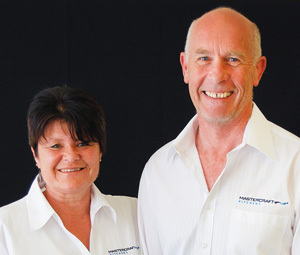 Owned and operated by husband and wife team Carol Harker and Tony Wilson, Mastercraft Kitchens Whitianga (also trading as Kitchens on Coromandel) has both a showroom and manufacturing plant on site. Everything from wardrobes and laundries to any other cabinetry around the home. Our kitchens are manufactured in our local factory and installed by our qualified tradesmen, ensuring your kitchen is perfectly fitted into your home with care and professionalism. Our showroom offers a full colour array and comprehensive sample range of doors, handles, hardware, accessories, splash backs and benchtops – from laminate to granite. Carol Harker has always had a passion for design. While attending an Interior Design course, at Waikato University, she was offered a job as a Kitchen Designer. After several years designing in Hamilton Carol, along with her husband Tony Wilson, purchased their own showroom in Auckland. They had this showroom for 4 years until the travel bug caught hold of them. After travelling overseas for several years Carol and Tony returned to New Zealand and settled on the Coromandel Peninsula. When the opportunity arrived to purchase a showroom and workshop on the Coromandel Peninsula they welcomed the chance to get back into the kitchen industry. Coromandel, Port Charles, Waikawau, Whangapoua, Te Reringa, Matarangi, Kuaotunu, Opito Bay, Whitianga, Hahei, Cooks Beach, Hot Water Beach, Tairua, Pauanui, Hikuai, Coroglen, Whenuakite, Kaimarama and surrounding areas. Photo credit: The kitchens on this page have been created by Mastercraft Kitchens Whitianga. Thank you to our fabulous clients who invited us into their home to photograph their dream kitchens. Photography by Jamie Cobel. Showroom hours: Mon to Fri 7:30am-5pm. Sat 10am-2pm. Sun by appointment.